9 museums in Santorini for a complete view of the island’s culture. The first of the 9 museums in Santorini is the Museum Of prehistoric Thera. The exhibition is structured in four units, referring to the history of research at Thera, the geology of Thera, the island’s history from the Late Neolithic to the Late Cycladic I periond (early 17th century B.C.) and the heyday of the city at Akrotiri (mature Late Cycladic I period, 17th century B.C.). In the last unit, in particular, various aspects are presented, such as the plan and architecture of the city and its organization as an urban centre, the emergent bureaucratic system, the development of the monumental art of wall-painting, the rich and diverse pottery repertoire, the elegant jewellery, the reciprocal influences between vase-painting and wall-painting, and the city’s and the island’s complex network of contacts with the outside word. Inscriptions, ranging from the Archaic to the Roman period. Vases and clay figurines, dating from the Geometric to the Hellenistic periods. 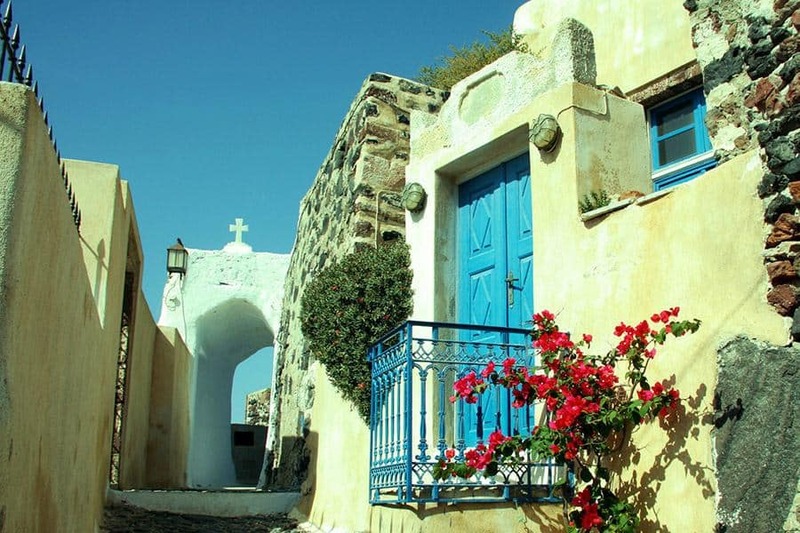 Megaro Gyzi, founded in 1980 by the Catholic Diocese of Santorini, is a non-profit organization housed in Fira, to a 17th century old family mansion of exceptional architectural interest. 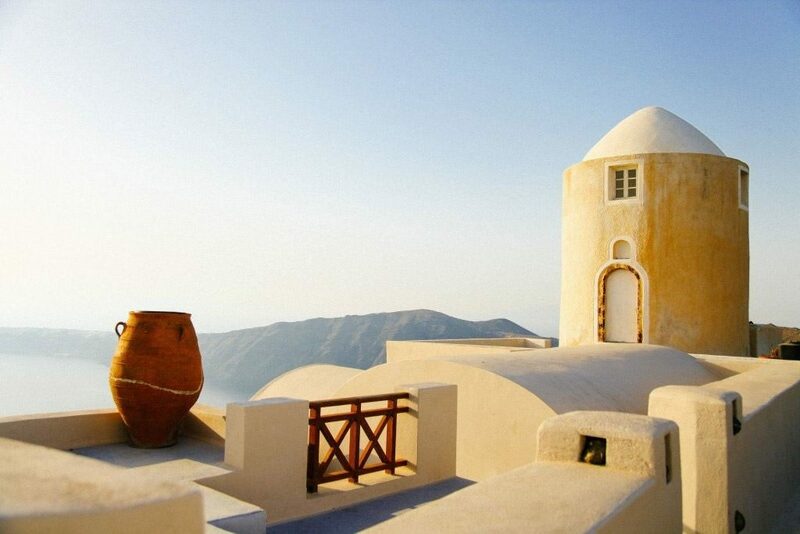 It aims to promote the cultural and spiritual life in Santorini. The idea to support initiatives which would promote the whole historical and cultural heritage of the island of Santorini (Thera), as well as of the Cyclades and the Aegean in general, was first born in 1969, when Mr. Petros M. Nomikos became President of the Organizing Committee of the 1st Congress on Thera. This received further nurture with the creation by the Petros M. Nomikos family of two non-profit cultural organizations, The Thera Foundation, and Idryma Theras – Petros M. Nomikos incorporated in the United States and Greece respectively. Collaborating closely between them, as well as with other Greek and international organizations and institutions, the sister foundations have been responsible for a wide variety of cultural activities, which aim at promoting archaeological and geological research about the island. The primary focus of their activities lies in sponsoring, with every means possible, the preservation and promotion of the findings unearthed at the prehistoric site of Akrotiri. The tradition of Santorini kept alive in Kontochori Fira, in cave that was built before half century or so.Where today houses the Folklore Museum, which is worth visiting the traveler. The Folklore Museum was founded by Emmanuel A. Hardy, lawyer, journalist and director of the newspaper “New Theraic”. The house, which houses, remained untouched by the earthquake of 1956, was restored in 1973 and then placed in this antique furniture, family heirlooms, the position utilitarian belong. In 1993 it was built in the museum wing to house the Gallery and laboratories, as well as the church of Agios Konstantinos, in memory of the owner of Emm Constanti property. Lignos, uncle of the founder. 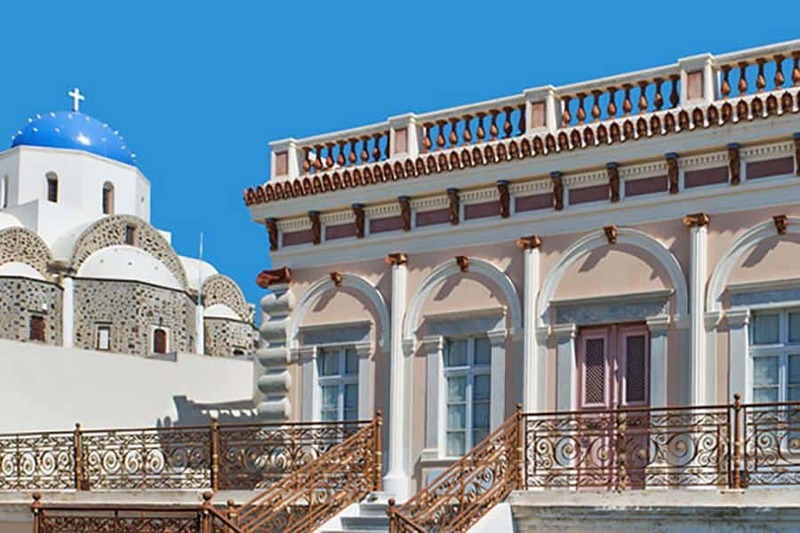 The Argyros Mansion is the only mansion open to the public on the island of Santorini and the most elegant witness of the 18th and 19th century architectural lines plus the most alive “representative” that reflects the everyday life of those centuries in the most elegant way. Long before Santorini won the hearts of visitors with its unique beauty, its wines were famous around the world and the Argyros family played an important role in winemaking and wine exportation. At the Argyros family mansion today’s visitors can enjoy a tour on the 19th century daily life and hear the “heartbeat” of the island’s mighty vine growers and wine traders. Aghia Triada, in the castle, which was the catholic of a small convent, was devastated by an earthquake in 1956. Under an initiative by the late Liza Marinou, President of the Association of Pyrgos Residents in Thera, and the residents, the church was rebuilt. The site remained closed until 1997. From 1995 to 1998, the Community of Pyrgos-Kallisti collected and preserved therelics. With the cooperation of the Second Ephorate of Byzantine Antiquities and the support of the Holy Metropolis of Thera, they inaugurated the site in August 1997. Since then, it is open as a permanent exhibition of holy images and ecclesiastical relics. 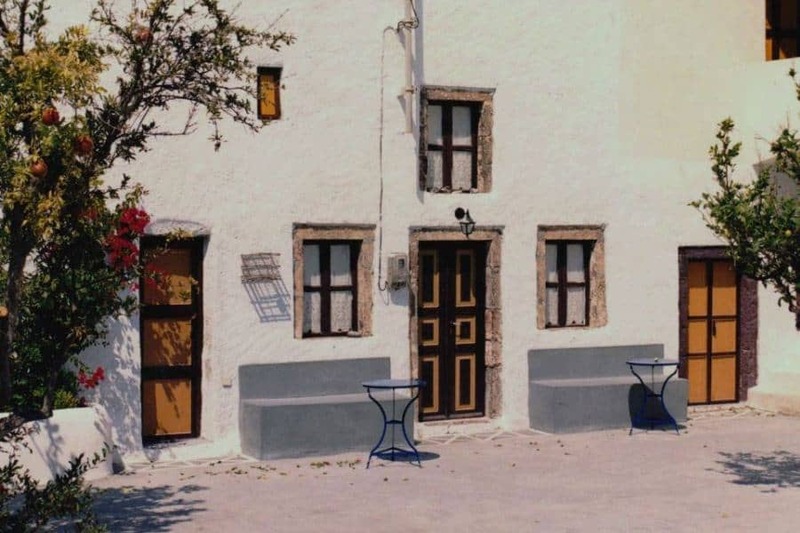 A new museum was inaugurated a few days ago in the beautiful village of Oia, the second museum in the village. The Museum of Ancient, Byzantine and Post-Byzantine Musical Instruments hosts the personal collection of Mr Christodoulos Halaris, a prominent musician who has studied thoroughly the roots of Greek music and its evolution through centuries. 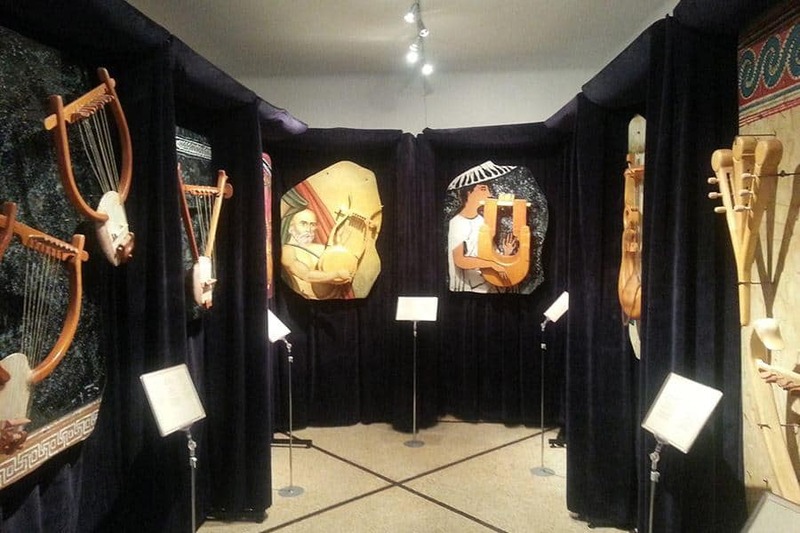 The musical instruments that are exhibited have been constructed by Mr Halaris himself, based on historical evidences for their existence and use from the prehistoric till the Byzantine times. Art Space is the last of our list with 9 museums in Santorini. Art Space at Santorini’s Exo Gonia continues from the year 1999 until today its art activities and extends its hospitality to important artwork by Greek and foreign artists. 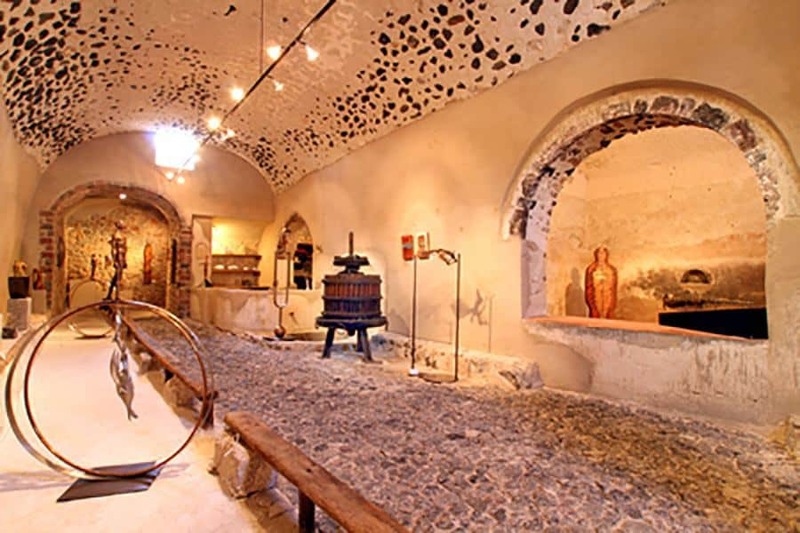 A unique Art Center within the pumice rock – carved chambers of an old winery. 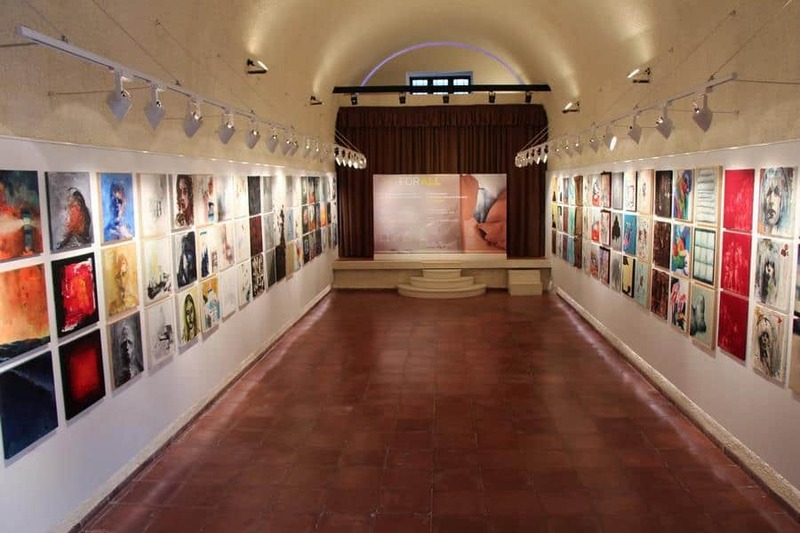 In this old winery dating back to 1861, representative works of art from the sphere of painting and sculpture are on display, offering visitors the opportunity to come close to contemporary Greek art and the course of artistic expression in Greece. This is the list of 9 museums in Santorini chosen by us and includes the most impressive museums of the island, whether you want to taste Santorini’s life or admire the Cycladic architecture.